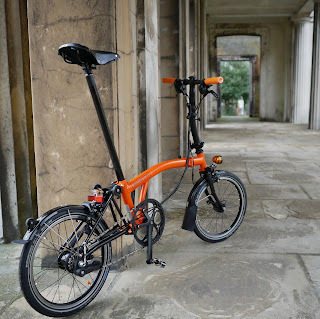 As you perhaps already know I have a new Brompton. 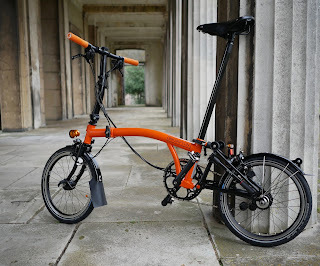 Despite me saying that I would never spend another Orange pound on a Brompton...here I go eating my words. I won't bore you with why I changed my mind but all I can say is that the decision was made pretty quickly and I simply went with the flow. 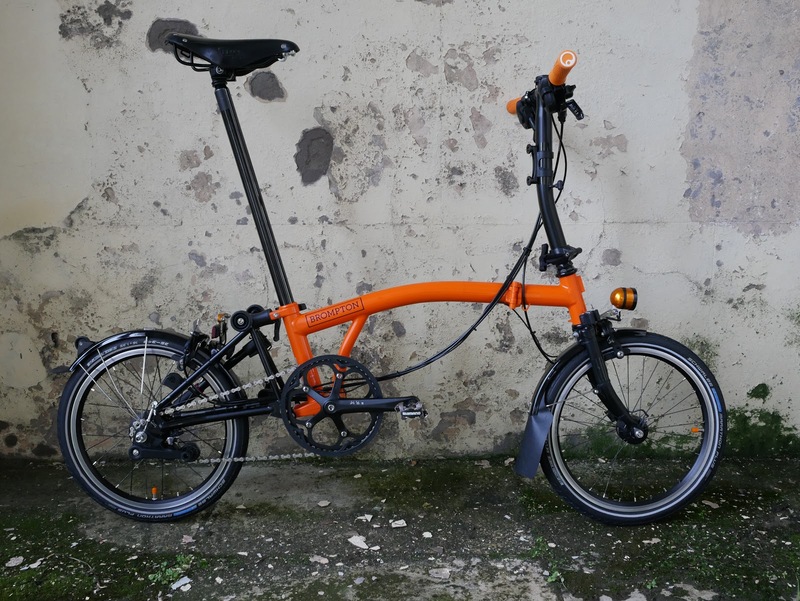 The bike is a 2018 All Black Special Edition in Orange. It reminds me in many ways of my first Orange Brompton which was orange with black extremities. I do like this a great deal better and black and orange are a killer combination for me. 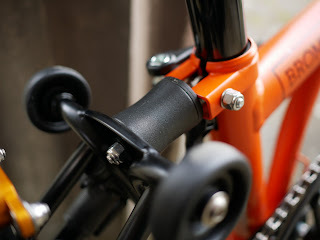 (You may recall me adding lots of black parts to my titanium Brompton I suppose to make my own special edition. I ended up hating the grey of the titanium spoiling the general look. This is definitely miles better). 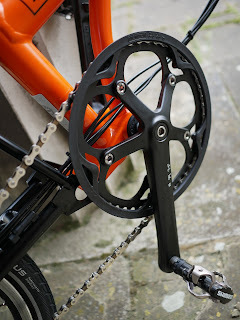 I chose a 6 x speed, standard 50t chainring (for the moment at least), extended seat post and would have chosen a firm suspension but there is only one option now - firm. More on this later. Already I have added a few optional extras. I do quite a bit of night riding and despite having some excellent battery lights I have always enjoyed the unlimited run time of dynamo lighting. It really is forget and go. 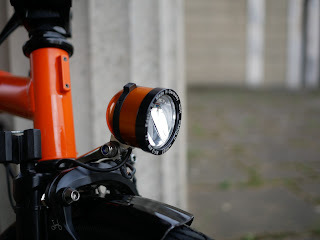 I had originally got a Supernova front light but didn't like it. The beam was bright but narrow and I actually preferred the beam from the Edulux II. I decided to keep the orange and black theme going and got a version in just that. (I have to say the colour seems to be a lot better than the one I bought and returned a few years ago. 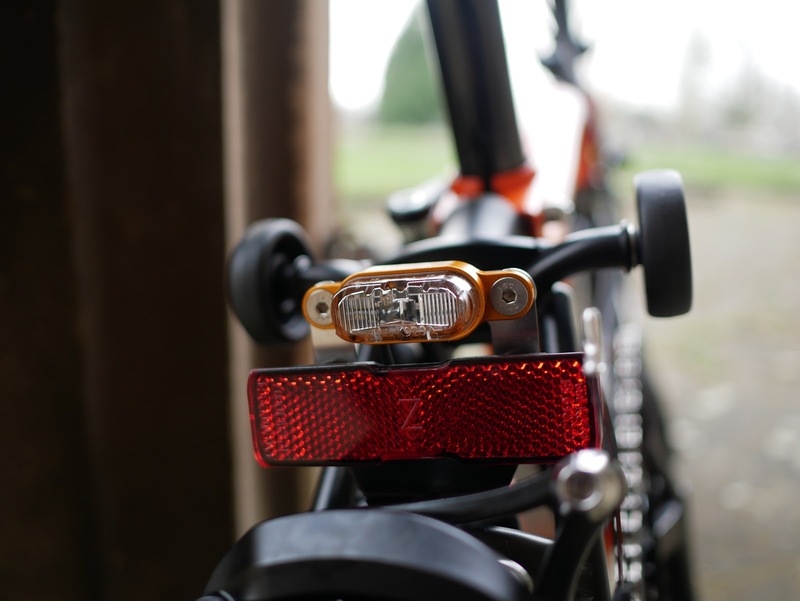 To go with the front light I decided to go for the SON rear light which I have to say is excellent. It works well with the optional rear reflector. The red light is very bright and can be seen from a wide angle. 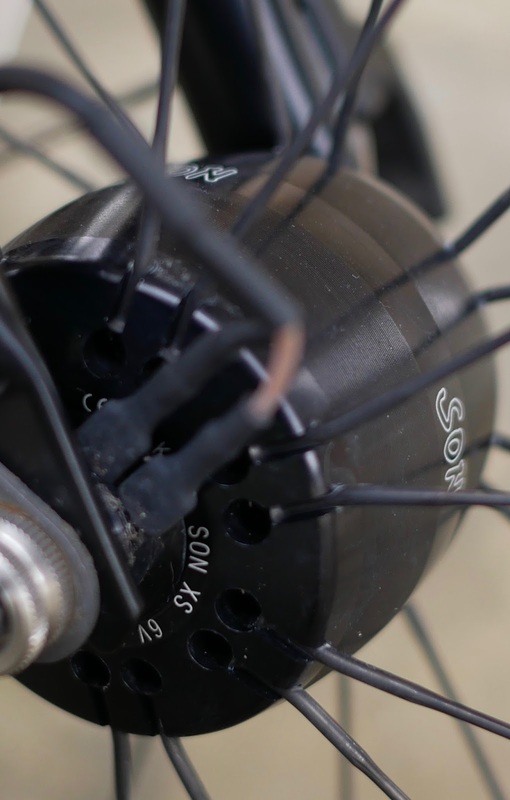 To power it all I opted for a SON XS in black with black spoke and rim. I have one of these on my P-type and it has been faultless. This one is a little lighter but apart from that and the different style it does the same job as efficiently. Having been on two night rides to the coast recently you could quite happily travel dark country lanes and be perfectly happy using just these lights. 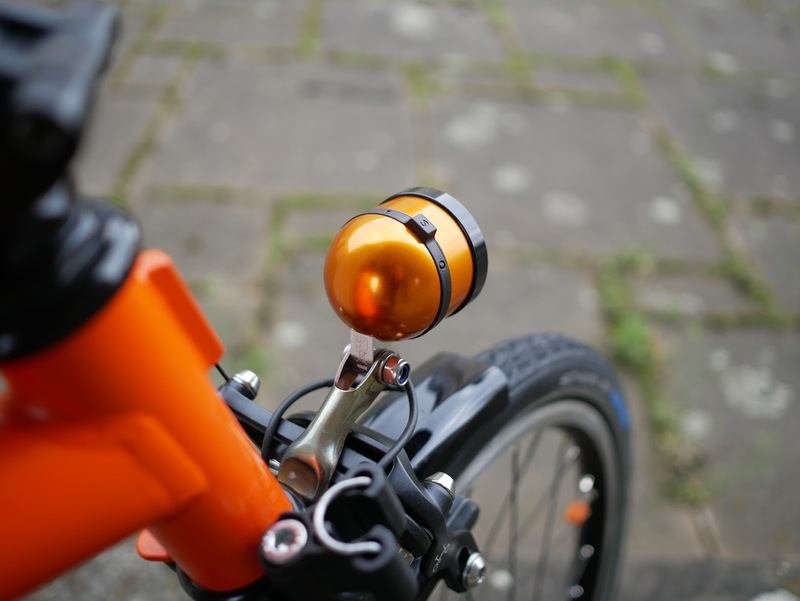 The only thing I would add for urban cycling would be a additional light that has a flashing mode - just to be seen. 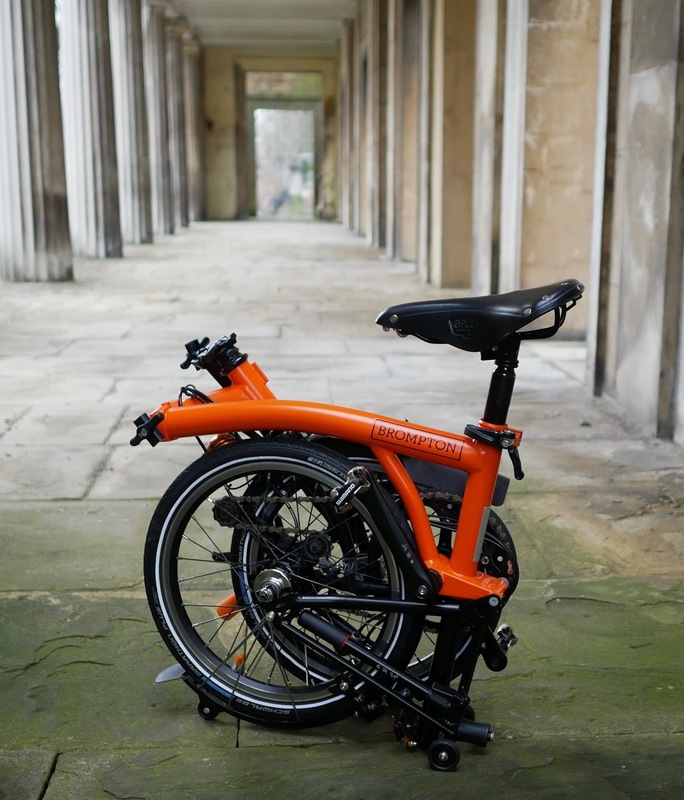 The 2018 Brompton bikes have the updated brake callipers. I have to report that these are pretty good and allow for confident braking. 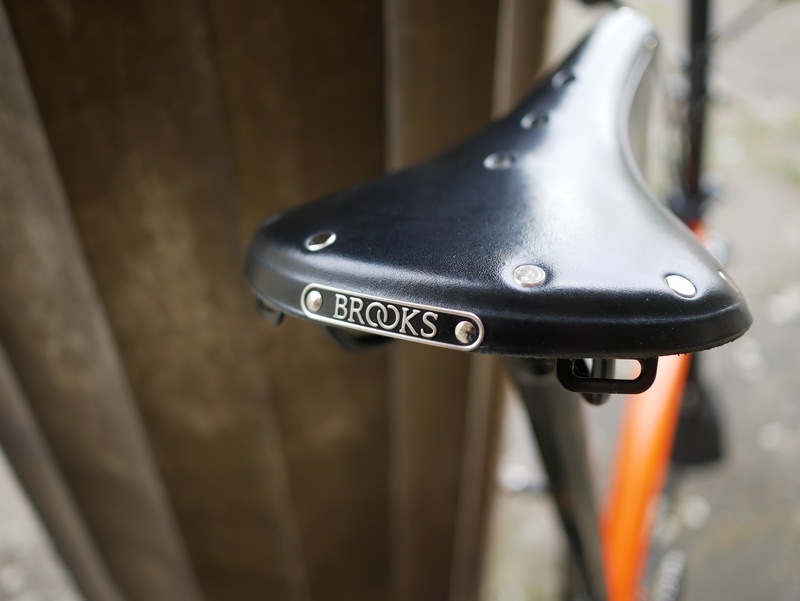 The Brompton saddle was taken off immediately and a Brooks B17 in black put on. It certainly let me know it was new on the London to Southend run but a few adjustments to its position resulted in a very comfortable saddle for 102 miles from last Friday night to early Saturday afternoon. I do have a black Brooks Swallow but I recently put this on my Condor road bike and it looks rather good on it so it will almost certainly stay put. 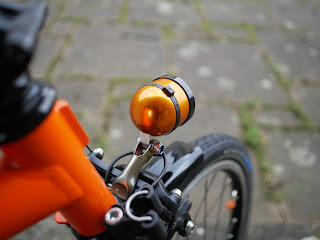 I had put on a Rixen and Kaul bottle mount to the front stem but this worked its way lose on the Southend run. I decided to try out a Monk Clip mount specifically for Brompton bikes which actually worked a great deal better. 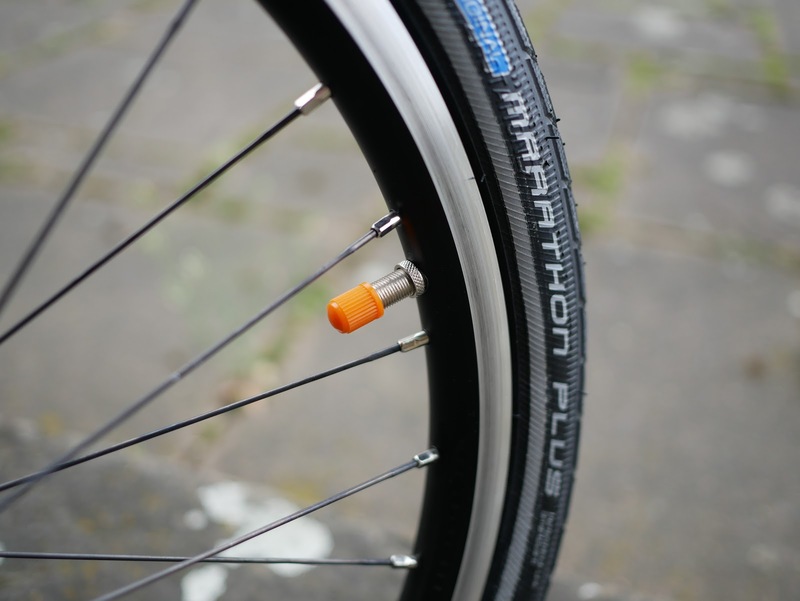 I am normally a Marathon user but as the Marathon Plus has been updated recently to allow 110 psi I decided to give them a go. No worries from me with regards rolling resistance or them feeling sluggish. (I did have these issues with the older version when I tried them a few years ago). 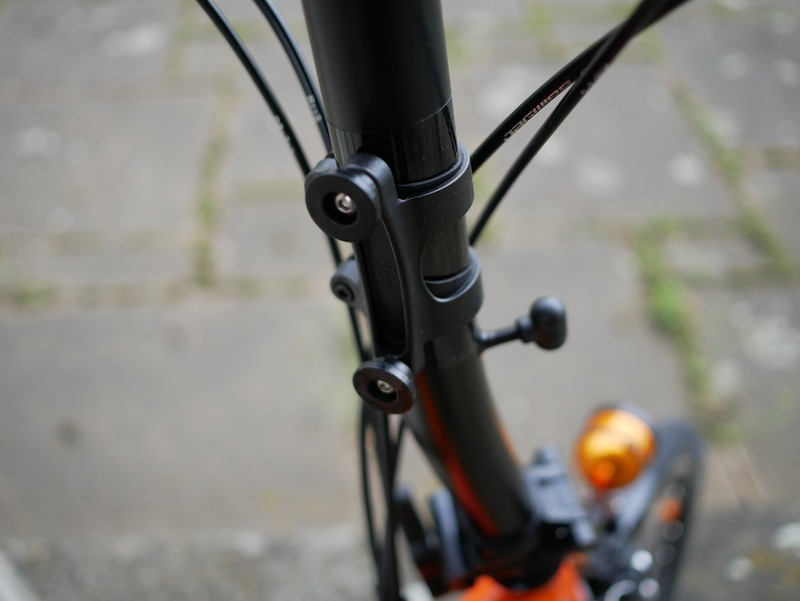 They run well and being slightly wider allow for a more comfortable ride. 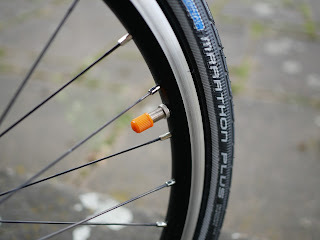 The bike came with Marathon Racers and these look good for being a summer tyre and a wiser alternative to the Kojak. The suspension block is now smooth with no ridges. There is no firm or normal just this. It is good. Definitely as firm as the firm suspension and if anything more so. I like it. The Brompton pedals also came off straight away to be replaced by some Shimano SDPs that I have got on well in the past with. The new lock on Brompton grips are actually really good and a massive improvement over the foam that was on bikes previously. The only reason they came off was I had a set of Ergon grips - in orange. These are same as those found on the pretty fine CHPT3 but in orange of course. 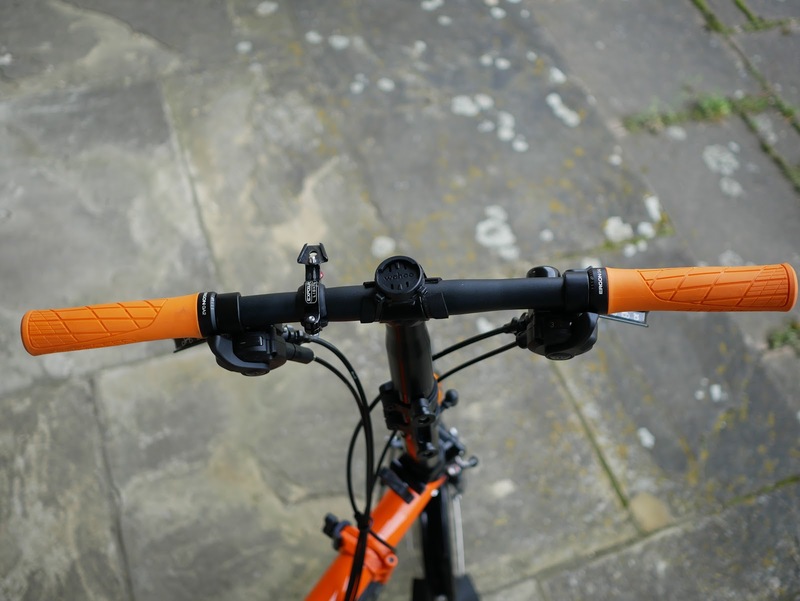 The space on the S-type bar is pretty good and made better by the new shifters. I have a Wahoo mount placed in the dead centre of the bars and a mount for my Exposure Toro front light. There you have it. 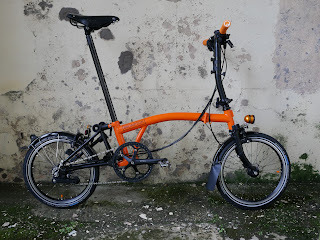 My new Orange Brompton. I am very please with it and having done a few distance rides on it I am pleased to be back with an S-type. Does this new Brompton replace your titanium bike ? 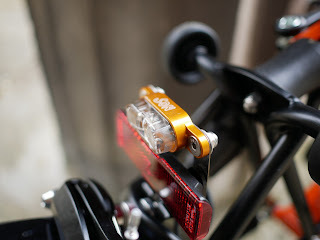 I see that the front Son light holder is quite different from the fragile one used on the titanium. Does this allow the front luggage adaptator to be used ? I sold the titanium quite some time ago. 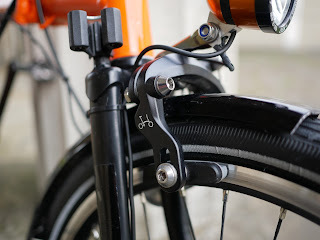 This light mount probably does allow a carrier block and bag to be fitted but I would almost certainly not use them on this particular bike. Congratulations for your new bike. May I ask you who you got the front wheen from? 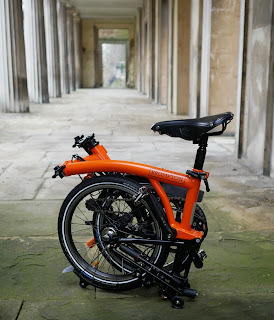 Did Brompton sell it directly or did you order it separately?